Indigo energy blend delivers hours of natural, long-lasting energy with no adverse side effects. These convenient, single-serve packs easily move with you to power your active lifestyle, leaving you calm and alert throughout the day. 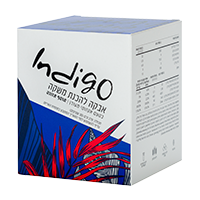 Indigo Energy Blend augments strength and endurance at the cellular level, increasing both stamina and performance. Potent antioxidants protect the body from damaging free radicals, while natural plant extracts increase metabolism, reduce muscle recovery time and inhibit inflammation, making Indigo Energy Blend the perfect addition to your fitness routine. Mix with 500 cc. of cold water. Drink and enjoy! Sweetener (Maltitol), Flavors, Dietary fiber (Inulin) , Food coloring (Beetroot extract), Acidity regulators (Malic acid, Citric acid), Vitamins (Ascorbic acid (C), Nicotinamide (B3), Pteroylmonoglutamic acid (Folic acid), Cyanocobalamin (B12), Pyridoxine HCl (B6)), Amino acids (L-Taurine, L-lysine, L-glycine, L-glutamine, L-arginine, L-isoleucine, L-leucine, L-Tyrosine, L-Valine), Maltodextrin, Guarana extract )Paullinia cupana(, Green tea extract (Camellia sinensis), Steviol glycosides from Stevia plant, Goji berry extract )Lycium barbarum(, Maca root extract (Lepidium meyenii), Ginseng root extract (Panax ginseng), Anti caking agent (Silicon dioxide), Acai berry extract (Euterpe oleracea).